About one in five sunlike stars observed by NASA's planet-hunting Kepler spacecraft has an Earth-size planet in the so-called habitable zone, where liquid water — and, potentially life — could exist, according to the new study. If these results apply elsewhere in the galaxy, the nearest such planet could be just 12 light-years away. 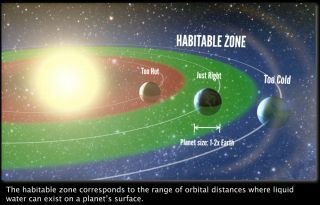 Analysis of four years of precision measurements from NASA's planet-hunting Kepler spacecraft shows that about one in five sunlike stars may have Earth-sized planets in the habitable zone. The findings, detailed today (Nov. 4) in the journal Proceedings of the National Academy of Sciences and in a video describing the frequency of Earth-like planets, say nothing about whether these planets actually support life — only that they meet some of the known criteria for habitability. Petigura also presented the results today in a briefing at the second Kepler Science Conference at NASA Research Park in Moffett Field, Calif, in which the Kepler team also announced the discovery of hundreds of new exoplanets, including many in the habitable zone. "I think it's by far the most trustable estimate available, but I don't think it's final," said Francois Fressin, an astronomer at the Harvard-Smithsonian Center for Astrophysics who was not involved with the study. To find these Earth-size exoplanets, Petigura and his colleagues used Kepler's measurements of stellar brightness to look for signs of dimming, known as transits, as planets crossed in front of their host star. Petigura and his colleagues painstakingly developed software to sift through Kepler's mammoth data set. The spacecraft's field of view includes about 150,000 stars, but most of these fluctuate in brightness too much for a planet to be detectable. The team examined 42,000 of the "quietest" stars, finding 603 planet candidates around these stars, 10 of which were Earth-size and lay in the habitable zone. They used the Keck I telescope in Hawaii to take spectra of the stars, in order to pin down the radii of the planets. But this wasn't the end of the story. Just as taking a census requires some statistical corrections for the people the survey misses, the researchers had to make corrections for planets Kepler missed. The transit method of finding planets, by definition, only detects planets orbiting in the same plane of view as their host star, which includes just a fraction of the total number of planets. Study researcher Geoff Marcy of UC Berkeley compared planetary orbits to papers fluttering through the air. Very few are going to be edge-on, he said. Secondly, the analysis misses some planets simply because the tiny amount of starlight they block makes them tricky to detect. To correct for this, the researchers inserted "fake planets" into the data so they could see how many their software would miss. The analysis was a "Herculean task," Marcy said. After making these corrections, the researchers had their result: About 22 percent of sunlike stars observed by Kepler have Earth-size, potentially habitable planets. This image shows field of view of NASA's Kepler space telescope, which stared at a single region of stars in the in the constellation Cygnus, just above the plane of the Milky Way Galaxy. The researchers were quick to point out that the fact that these planets are Earth-size and lie in the habitable zone does not mean they could support life. The planets might have scorching-hot atmospheres, or no atmospheres at all, they said. Even if the planets have all the basic ingredients for life, scientists don't know the probability that life would ever get started. The definition of Earth-size planets in this study was pretty broad, Fressin said. For instance, a planet that has a radius twice the size of Earth's might not even be rocky, he said. Kepler mission scientist Natalie Batalha, an astronomer at NASA's Ames Research Center who was not involved with the study, agrees it's a generous definition. Rocky planets with a radius about 1 to 1.5 times the size of Earth's have been found, but the fraction of larger planets that are rocky is probably much lower, Batalha told SPACE.com. Still, it's a fair start, she said. "Kepler's prime objective was to understand the prevalence of habitable planets in the galaxy," Batalha said at a news conference. "This is the first time a team has offered such a number for stars like the sun." The researchers had to extrapolate the number of planets with orbits longer than 200 days, because these haven't been detected in the Kepler data. "Ideally, we won't rely on extrapolations," Batalha said. "But as a first cut, this is a valid thing to do." Last week, Marcy and his colleagues reported the discovery of the alien planet Kepler-78b, a rocky world nearly the same size and density as the Earth. But Kepler-78b hugs its star at a distance far too close and hot to be habitable, with surface temperatures of about 3,680 degrees Fahrenheit (2,027 degrees Celsius). Kepler went out of commission in May, after the loss of a wheel used for pointing the spacecraft. Nevertheless, scientists will mine Kepler data for decades to look for potentially habitable planets. "Maybe with future instruments, we could actually image these planets," Petigura said.